The busyness of the Christmas season has ramped up a bit at our house this week as I am finally realizing time is decreasing and my "to do" list isn't finished yet! We are hosting our annual Cookie Exchange (for moms) next week AND I am trying to get our house ready for new presents, so we are busy de-cluttering and cleaning. 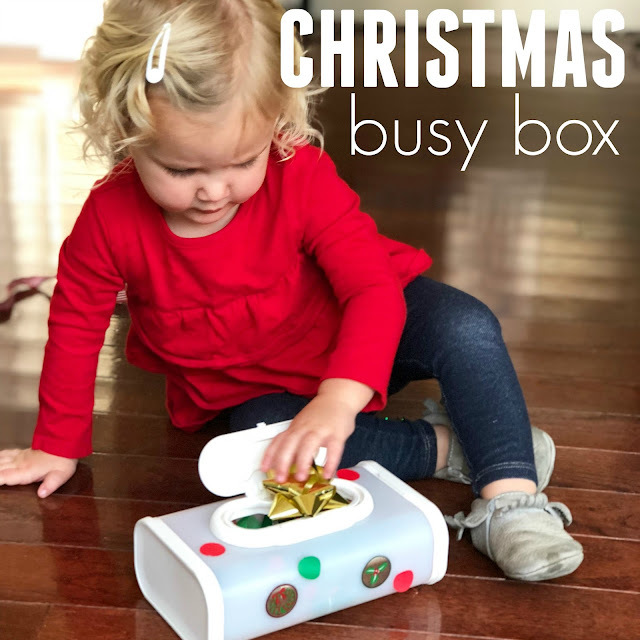 One fun and festive way to keep little kiddos occupied while you try and get something done is by creating a Christmas Busy Box or busy bag! For Day 15 of our 23 Days of Christmas activities series we made a box and had so much fun playing with it! There are so many busy bags and boxes that have saturated the internet over the past few years. You can buy some online or make them yourself. I prefer to make them because they are simple to put together and you can use materials that you have around your house. My creative friends have a lot of great ideas on this Busy Bags for Kids Pinterest board. Busy boxes/bags are great to stick in your purse and take places too- especially busy bags which are usually a bit smaller! To get started, we make sure our wipe container was cleaned. They I cut out the center part of the opening to make more space for little hands. The Huggies wipes container we used has a soft squishy material close to the opening that is easy to cut and won't hurt little hands. Next we gathered our materials! For our busy box I collected some of the same items that I use on our Christmas sensory board. I also added in a few small gift bows. I make sure that all items are safe for toddlers and not choking hazards. The large jingle bell was a favorite along with the Christmas tree felt puppet, ribbon, festive hair ties that squish and make sounds, and the burlap star. I tried to find a variety of items that had different textures. After we collected our items, we grabbed some Christmas stickers and decorated our box. Next, I stuffed everything inside and let my toddler have fun! She loved opening and closing the wipes box and then moved into playing with the materials and putting them in/out again and again after that! This was such an easy activity to put together and I got the whole fridge cleaned out while she played, so I'd call that a win! If you've made a busy bag or busy box before, I'd love to hear what materials you have used and what type of box/bag you created! It just keeps getting more and more fun! Having the goal to do ONE simple holiday activity each day has been really fun this season! It is nice to schedule time to create and enjoy the season with my kids! If you have tried out any of our activities, I'd love to hear about it!